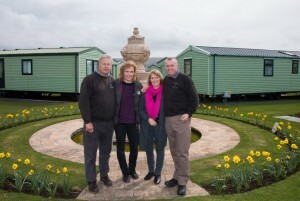 Gwynedd Holiday Home Park in Mid Wales is keeping it in the family as it’s new managers are announced. After more than a decade the park managers George and Menna Freeman have retired and handed over the reins to their son Jonathan and daughter-in-law Michaela. Both Jonathan and Michaela have experience in park management, having previously run Green Meadow Holiday Home Park near Aberystwyth. Now, in addition to managing the 80 pitches at Gwynedd Holiday Home Park, the couple have also taken on 70 pitches at Glan-y-Don Holiday Home Park next door. “When we were told that mum and dad were retiring a managers, we were given the opportunity to take over from them,” explained Jonathan. “We loved managing and developing Green Meadow where we made many friends, but the time was right for a new and bigger challenge. Looking forward to a retirement cruise to the Norwegian Fiords this summer, George and Menna say they will still provide cover as relief managers for Salop Leisure in the future when needed. “We thoroughly enjoyed our 10 years at Tywyn and made some very good friends on the park and in the local community,” said George, who still owns a caravan holiday home on Glan-y-Don Holiday Home Park.